If you want to make a green room in a subtropical climate, it is a good idea to chose species that are native to this type of environment. Start by researching the prevailing conditions on the roof, and then try to find plants that fit that profile. Some subtropical parts of the world are for instance much more arid than others, and the number of sunshine hours can also vary significantly between a habitat with mostly clear skys and a habitat with many ovecast or partially cloudy days. Does it rain every month, or will the plants have to cope with a dry period? Are you planning to water the plants on the roof? Are there periods of very heavy rainfall? Will the plants be in direct sunlight all day? The answer is often yes for roof gardens. Lowest and highest temperatures in the year. Is there a risk of frost at any time of the year? Do you want very low plants only? There are many examples of successful green roofs in suptropical parts of the world that have been planted with well-chosen members of the families Crassulaceae and Aizoaceae. Both of these families contain plants that keep their pores (stomata) closed during the hot day and open them only at night. Because of this, they are good at handling sunny conditions. You can read more about Crassulaceae and Aizoaceae in separate articles here on our site. This isn’t a member of Crassulaceae or Aizoaceae; it instead belongs to the family Verbenaceae. It spreads quickly and forms a nice groundcover. Recommended spacing when planting is 60 cm. In English, the plant is known as Moss Verbena, but it is not a moss. Delosperma cooperi is a member of the Aizoaceae family. It forms a spreading groundcover. Recommended spacing when planting is 60 cm. In English, it is known as the Trailing Iceplant. It is a perennial plant, native to South Africa. Dianthus gratianopolitanus is a member of the Caryophyllaceae family. Unlike the spreading ground-cover plants, this one forms a clumping ground-cover. 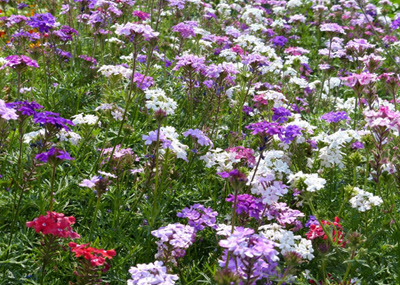 The recommended spacing when planting Dianthus gratianopolitanus is just 45 cm. 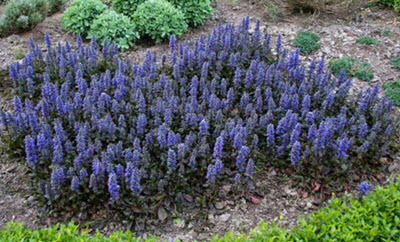 Ajuga reptans, also known as Common Bugle, is a spreading ground-cover plant. Recommended spacing in 45 cm. It belongs to the family Laminaceae. In many subtropical locations that experience heavy rainfall, sloped roofs are ubiquitous. It is possible to plant a sloped roof in the subtropics, but it does of course pose specific challenges compared to planting on flat roofs. It is important to secure the soil well, both to prevent it from sliding down in one piece and to prevent gradual soil erosion. The supporting structure must be strong enough to keep the sod from sliding even during heavy rains. Erosion blankets and soil stabilization products can be used to lower the risks associated with planted sloped roofs. In some situations, purchasing already established sod (soil + established plants, with the plant roots holding the soil together) is the best way to go, combined with other security measurements. Please know that in this context, roofs with a slope of 2% or less are considered flat roofs. If the slope is between 3:12 and 5:12, it’s low-slope roof. Up to 9:12 is medium slope, while anything from 10:12 and above is considered high slope. Many subtropical parts of the world experience excessively warm and humid conditions, at least during parts of the year. This can increase the risk of certain plant diseases, including many types of mold, mildew and rot. You can reduce the risk by selecting plants that are adapted for these specific environmental conditions. Proper drainage of the soil is also importnat. Energy conservation. A planted roof can reduce the roof temperature, thereby decreasing the cost of climate control inside the house. Harvesting rainwater for use, or simply to reduce the risk of flooding. Some green roofs retain up to85% of rainfall, reducing the risk water flooding streets and homes. In dense urban environments, a planted roof can serve as an urban oasis, benefiting flying animals such as butterflies. Noise reduction for building occupants. 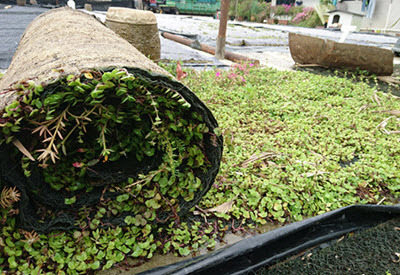 Unlike a dead surface, a living roof binds carbon dioxide and filters air pollutants. In some parts of the world, a green roof that fulfils certain requirements can qualify the building for national, regional and/or local tax incentives. Studies have shown that a properly created and maintained planted roof can reduce roof surface temperatures by 40 degrees Fahrenheit in subtropical locations. In some studies, the energy savings reached 30%.